4 Reasons you Should Install a Fence | Done Right Landscape and Construction Company Inc.
Often times, a fence is the first thing that someone will notice when they come to visit your home. Therefore, it’s important to choose one that sets your property apart from the rest. Whether your style is a more traditional white picket fence look, or you’d like to try a modern vinyl, there are so many options to choose from. Beyond the curb appeal, there are several benefits to adding a fence to your property. From decorative purposes to added privacy, security, and marking off your property; A fence is a worthy investment! 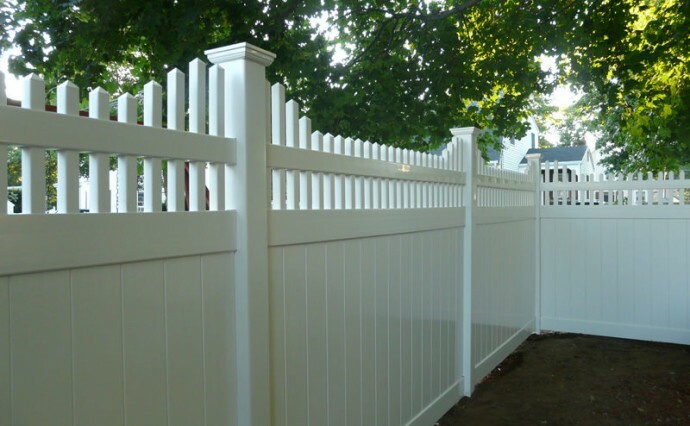 The aesthetic appeal of most fences is one of the main benefits of installing a fence. It is the final touch that any beautiful landscape needs to feel complete. Adding a fence will also increase the value of your property. If you’re a realtor trying to sell a property, adding a decorative fence will help to impress your clients! One of the most important factors that people consider before purchasing a home is privacy. Everyone wants to feel like they can be comfortable in their home, without worrying about if people on the streets can see their every move. Installing a fence is a great way to add some privacy to your property, especially if it’s located on a busy street. If privacy is your main concern, it’s important to consider the type of fence you’ll install, as some provide more privacy than others. For example, chain-link fences are see-through and don’t provide any privacy. Rather, you should consider a wooden or vinyl fence for optimal privacy. If security is of concern in your neighborhood, this is another reason you may consider installing a fence. Installing a fence can give you peace of mind that intruders and unwanted guests will be lurking in your yard late at night. You can rest assured letting pets or children play outside, without them being able to escape the boundaries of your fence. In this case, a wooden fence would probably be the best option. Marking your territory is another advantage of installing a fence, especially if you’re in a tightly packed neighborhood. Putting up a fence will prevent your neighbors from encroaching on your space. On the contrary, if you own a large farm or hundreds of acres of land, marking it off with a fence is key to make it clear where your property starts and finishes. This will also help maintenance people to know exactly where the area they should be mowing the lawn, etc., is. It’s evident that installing a fence can have many different benefits for your property. Whether you’re a homeowner looking to enhance your home, or realtor trying to sell a property, a fence may be just what you need. For quality fence installations in the Middlesex and Essex County\, you can count on Done Right Landscape! Fill out a contact form or give us a call today at 781-858-8000!